At what point can we start calling pesticide makers the true pests that need to be eradicated? At this point the number of pesticides in the world is beyond alarming; it’s (literally) sickening. In the UK, it has been estimated that enough pesticide is used to account for 420g for every woman, man, and child. In the US, the numbers are similar, if not even more extreme. Globally, there are now more than 50,000 different pesticides being manufactured with over 600 ‘active’ ingredients – and yet we still have pests. How can this be? The alarms have been sounding about the over-use of pesticides and herbicides for years now, and recently, the UK press has noted excessive pesticide levels in vegetables like carrots and lettuce, but they aren’t just in the obvious places. The Association of Preconceptual Care has discovered that pesticide dangers lurk in everything we put on our tables. Almost everything we eat in the conventional diet is subject to manifold doses of the chemicals – pesticides, fungicides, herbicides, and more. Some crops get the brunt of pesticide contamination with cereal crops such as wheat being baptized an estimated five to eight times during just one growing season, while other foods are subject to lower doses. (Check out the Environmental Working Group’s 2015 Dirty Dozen list to discover the 12 most pesticide-laden produce as well as the 15 cleanest produce. Other vegetables and fruit crops will be treated with 10 to 15 sprays, and that’s considered the norm. Add to this ridiculous amount of toxins we’re exposed to, the pesticides used in raising livestock (even arsenic compounds), pesticides used at parks and even on protected forestland, and you have a recipe for environmental devastation and human health problems like we are seeing today. Even modern building practices have incorporated pesticide use into their normal business. Lindane is used in wood preservation and an insecticide called aldrin is often applied to electrical cables. It seems there is no end to what we will spray, and its gone way beyond any explainable practicality. Nearly seven billion pounds of pesticides are used annually around the world for these various ‘treatments’ to rid our environment of pests. Twenty five million agricultural workers (minimally) experience pesticide poisoning every year, and the rest of us are likely affected adversely – even if negative health effects don’t show up until several years after exposure. 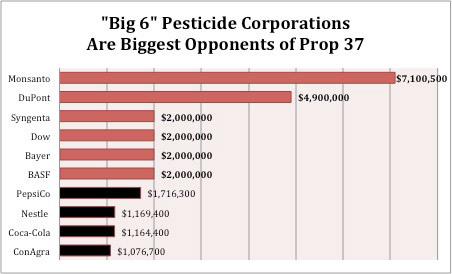 Though there are other companies poisoning the planet, these six companies alone account for much of the problem since GMO crops require more pesticide and herbicide use. With 50,000 types of pesticides, who are the real vermin here? Do you drink coffee? Caffeine is like 10 times more toxic than the most popular herbicide – glyphosate. Moreover, residue on the crops is very low as most used pesticides nowadays break down once they are released. Insecticides are almost harmless to mammals, you need ridiculously large amounts to do any damage to mammals. Though it strongly affects insects and fish. Instead of chasing readers, read scientific material that states the facts instead of spreading lies. I guess making money makes these companies lose their moral compass. So our favorite food companies make pesticides too.